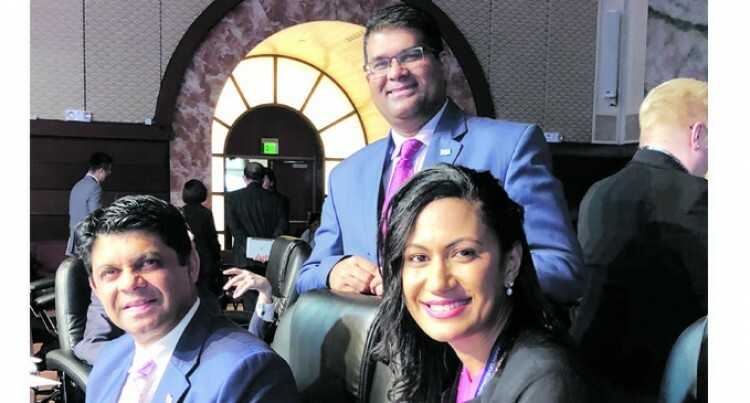 From left: Attorney-General and Minister for Economy Aiyaz Sayed-Khaiyum, Reserve Bank of Fiji Governor Ariff Ali and Office of the Attorney-General Legal Officer Suliana Taukei during the business session event attended by the Asian Development Bank Governors where they discussed governance matters and ADB operational direction at the ADB Headquarters in Manila, Philippines. The Asian Development Bank continues to respond to the growing needs of the Pacific region. The ADB president Takehiko Nakao deliver­ing his address at the opening session in Ma­nila of the Board of Governors during the 51st annual meeting said: “ADB’s own financial commitments, including loans, guarantees, and equity investments, were a record US$20 billion (FJ$41 bn). “Of these amounts, our private sector opera­tions amounted to US$2.3 billion (FJ$4.77bn), and they mobilised commercial cofinancing of US$5.7 billion (FJ$11.82bn),” Mr Nakao said. “Including official and commercial cofinanc­ing and technical assistance, ADB’s total com­mitments last year were US$32 billion (FJ$ 66.4bn), a 26 per cent increase from 2016. “Approvals for the financing of climate miti­gation and adaptation reached a record US$4.5 bn (FJ$9.3 bn) in 2017, a 21 per cent increase from the previous year. “We are in a good position to achieve our tar­get of doubling annual climate finance to US$6 billion (FJ$12 bn) by 2020. “These strong results were made possible by our solid capital base, thanks to the success­ful merger of the Asian Development Fund lending operations with the ordinary capital resources balance sheet—which took effect at the start of 2017. “We need further efforts to accelerate dis­bursements and increase cofinancing. ADB approved a new procurement policy in 2017 to reduce procurement time, support the adop­tion of high-level technologies, and better ad­dress life-cycle costs. “Along with our increased volume of opera­tions, we are promoting innovative approach­es and advanced technologies. “For example, in Indonesia and Pakistan, we are using satellite data and remote sensing to improve irrigation. Mr Nakao said on the funding side, ADB stepped up efforts to raise local currency fund­ing to meet the growing demand for local cur­rency loans in its private sector operations. ADB also issued new thematic bonds such as gender bonds and health bonds. “I will now turn briefly to the economic out­look for Asia and the Pacific. “Developing Asia grew by 6.1 per cent in 2017, and we expect growth will be 6 per cent in 2018. Excluding the four newly industrialised economies (Hong Kong, China, Republic of Korea; Singapore; and Taipei,China), develop­ing Asia’s rate of growth is expected to be 6.5 per cent in 2018. The People’s Republic of China is expected to grow 6.6 per cent in 2018, even as its growth continues to gradually moderate. In India, growth should pick up to 7.3 per cent. “The Association of Southeast Asian Na­tions (ASEAN) region, with a large total popu­lation of 650 million, is continuing to grow at 5.2 per cent. The recent rebound in oil prices has helped relieve fiscal pressures in oil-pro­ducing economies in Central Asia. “Although challenges remain, Asia and the Pacific is well positioned to sustain its growth momentum, supported by robust private con­sumption and investment, and anchored by sound macroeconomic policies and structural reforms. “Active trade and foreign direct investment are the foundation of Asia’s economic success and are essential for continuing solid growth. One significant factor Mr Nakao said that would help drive the region’s future growth is advancements in technology. “New technologies are emerging faster than people can imagine,” he said. “New technologies such as robotics, artifi­cial intelligence (AI), and “internet of things” have huge potential to raise productivity and improve our daily lives. “In Asia, young entrepreneurs and home­grown innovations are becoming an increas­ingly important part of the economy. “At the same time, there is growing concern that the rise of new technologies could cause widespread job losses. “Today, we are seeing many new types of high-skilled jobs in information and commu­nications technology (ICT), health care, educa­tion, and all kinds of business and consumer services.